"Let's Celebrate Our Juanita Community"
On March 5, 2016, the Juanita Neighborhoods Association participated in the Welcoming America movement by hosting a Welcome to Juanita event to celebrate the different cultures in our community. The event included musicians, dance performers, booths, and free food. Since that time, we have held several Welcoming Events to celebrate diversity and inclusion in our community. The Juanita Neighborhoods Association promotes community building and inclusion of everyone from our diverse area. Everybody should feel comfortable and welcome while living in and visiting our neighborhoods. If there is a way we can make our community a more welcoming place, then please let us know! We welcome speakers at our meetings and cultural demonstrations at our events. Please let us know how we can help you or how you would like to be involved with us! ​The next Welcome Week event is Saturday, September 15, 2018 and will be held at Edith Moulton Park. Please contact us if you would like to participate in the upcoming event. We welcome your ideas for the event. We need sponsors, donations, participants, and volunteers to make the event a success! The Juanita Neighborhoods Association hosts an Annual Summer Picnic to celebrate our wonderful community. The Annual Summer Picnic is our major community building event of the year. The City of Kirkland promotes neighborhood summer picnics and help sponsor the events through the Neighborhood Services Program. The Annual Summer Picnic is a 100% volunteer effort and relies on support from community businesses, organizations, and individuals. We celebrate the Juanita Neighborhoods with entertainment, performers, booths, children's activities, and free food. 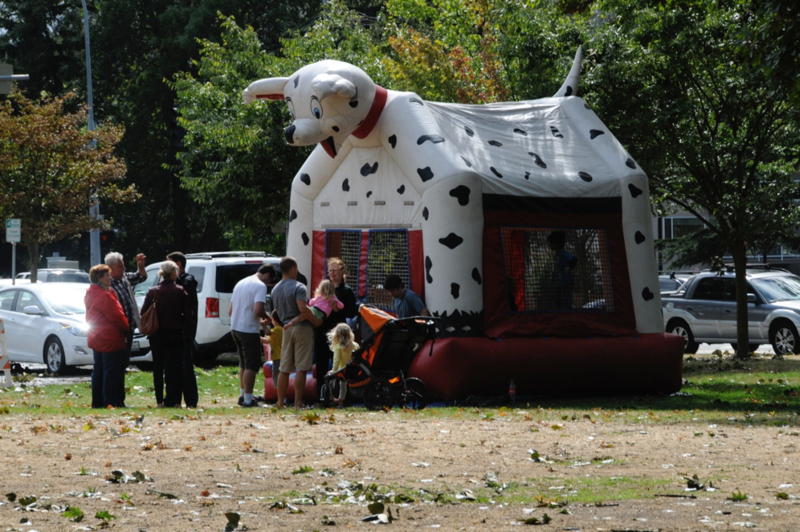 Recently, the Annual Summer Picnic has included dog activities with the theme "Juanita Dawg Days of Summer." Every summer is a new event. In recent years, we have had dog themed summer picnics and Welcoming Week events. Do you have an idea for a theme? Would you like to volunteer, participate, and/or sponsor the event? We welcome community members to help us create the event every year. Do you have an idea for an event? Please let us know!